HA_NC_w20 - "Whisker Type" probes for noncontact/semicontact modes with inclination angle 20 degrees. Not even every surface of interest has a plain structure. Moreover, in most cases it may have a rather complicated topography, with many ups and downs. To investigate such features properly matching this task probe must be used. A standard probe has a limited size and in case of narrow gaps cannot fit them (too short and wide). Also it's true when the height's difference is greater than the probe's dimensions. NT-MDT SI offers a special probe, designed for studying deep holes, trenches and narrow gaps. It differs from any standard probe by having at the very end a long and slim "whisker". - To profile a shape of sidewalls. Due to a variable angle of inclination (see Fig.2), no more mechanical restriction! The "whisker" tips go deeper inside narrow gaps when the standard cantilevers fail to measure! - For imaging of the trench's bottom. That is not possible using a standard probe due to its size's limitations, but because of the very high aspect ratio of "Whisker" tip we can do it easily. Fig. 2 Any angle of inclination α you need to match your SPM holder specification can be produced. Just specify the angle of inclination you want. Let's see how it works on a simple example. The structure shown on the Fig.3 was investigated by two different probes – standard probe and probe with "Whisker" tip. Fig. 3 SEM image of the structure. Dark places correspond to holes, while light colors correspond to absence of copolymer. Sample: E-beam lithography mask for fabrication SET devices by shadow evaporation technique. On the Fig.4 SPM images of the structure obtained by difrerent probes are shown – standard probe (on the left, Fig.4) and probe with "Whisker" tip(on the right, Fig.4). The width of gaps was about 100 nm. These images show the main advantage of the whisker: it goes much deeper and gives a uniform distribution of pattern, while the standard one fails even to reach the bottom! Fig. 4 On the left – results of imaging by the standard probe, the depth was only 170 nm reached.While the wisker achieved the bottom (530 nm) and showed a uniform distribution. Free calibrated SEM photo for each "Whisker Type" tip to let you know its real shape. Fig. a: SEM image of "Whisker" tip specially designed for measurement of samples with near vertical sidewalls. Fig. 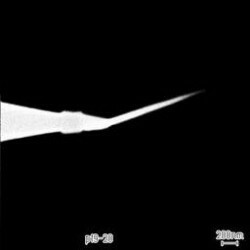 b: SEM image of four "Whisker" tips grown on the silicon tip in accordance with eset sketch. Chip thickness H: 0,4 mm. HA_NC_w20 - for noncontact mode. At customer's requirement tip side of the probes can be coated by conductive coating. Other cantilever specifications are available. Please, contact us for more information.